Each of our Custom Waiter's Corkscrews features an extra long handle for increased leverage, an elongated corkscrew for long corks (nickel-plated or with black Teflon), a hinged bottle opener, and a small hinged knife blade housed in the handle for removing foil wraps. Each Corkscrew measures 5-3/8" long with an imprint area that is 2-3/4" long by 5/16" wide. Production time for Custom Waiter's Corkscrews is about two to three weeks after proof approval. 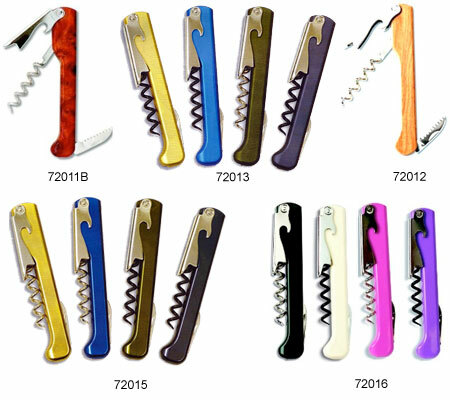 For additional information on our Custom Waiter's Corkscrews, please contact us at 1-800-233-0828. You might also be interested in our Custom Imprinted Pocket Corkscrews and our Custom Bottle Openers.